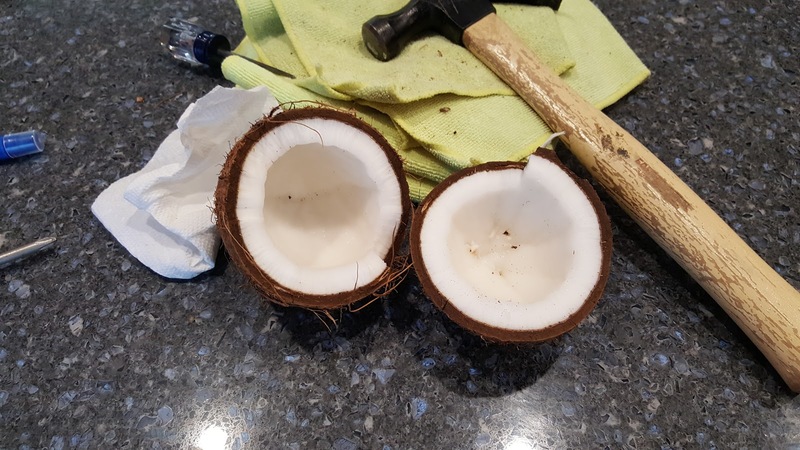 There's something profoundly satisfying about cracking open a fresh coconut. Maybe it's the fact that step one involves going into the basement to retrieve a hammer and awl (and step two involves dousing said tools in Everclear to make them at least somewhat sanitary). Or maybe it's that solid cracking sound. Either way, today's treat was both fun to open and tasty to eat. The jury is still out on my taste for coconut water. On one hand, the slightly sweet taste is good, and the fact that it has health benefits is a nice bonus. On the other hand, it does taste like warm dishwater, so there's that. I recall my first run-in with coconut water. It was in Punta Cana, 7 years ago. I was psyched that I scored a coconuts with a straw being offered by the resort. I took a big 'ol pull, only to be met with an off-tasting liquid. I recall thinking: surely people don't actually drink this stuff, do they? I've grown since then. 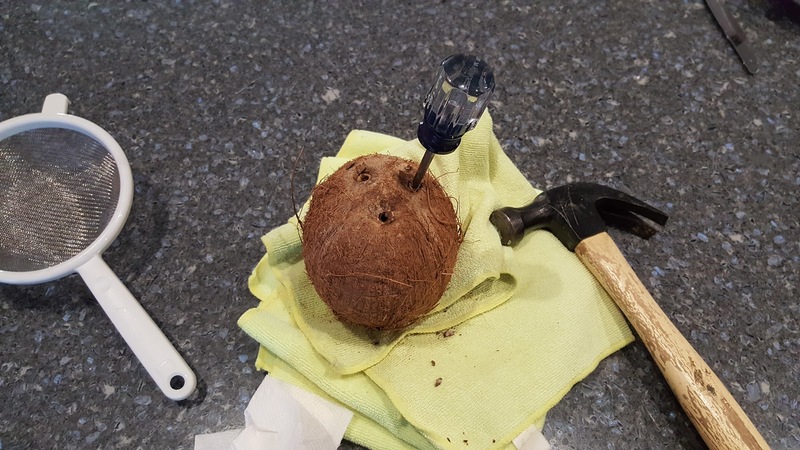 It seems like everyone has their own hack for accessing coconuts. Ultimately, it was these two videos that got me access to the one above. The first video is quite exhaustive, while the second video is a quicker and easier method. Either way, the results are more or less the same.